Last week, DC announced that just over a year after his "death" at the hands (well, eyebeams) of Darkseid in "Final Crisis," Bruce Wayne will be returning next April in a time-travel epic by Grant Morrison that sees Batman as a caveman, a pirate, a cowboy, and a noirish private eye. This is quite possibly the most awesome thing we have ever heard. But with all the potential for Batman's time-travel hijinx, the only ones we really know about are those listed above, and the Twittering of @timelostbatman is only making us want more. 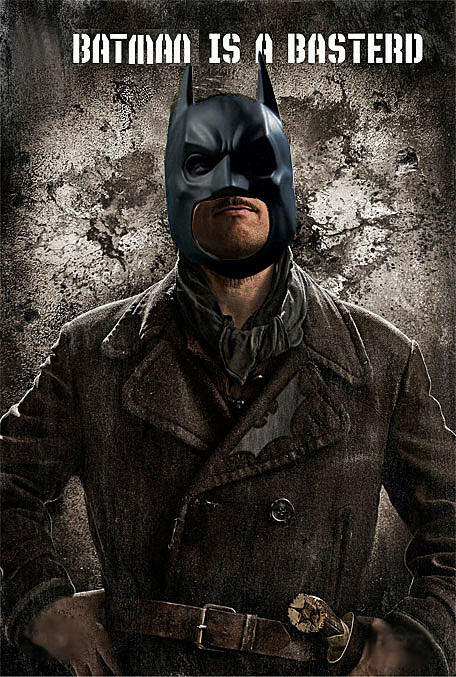 That's why we turned to ComicsAlliance contributor and semi-professional Batmanologist Chris Sims (and Photoshops from Caleb Goellner) to bring us a list of eras we're hoping the Dark Knight hits next April! "Know, O Prince, that between the years when the oceans drank Atlantis and the gleaming cities, and the rise of the Sons of Aryas, there was an Age undreamed of, when shining kingdoms lay spread across the world like blue mantles beneath the stars -- Themyscira with its dark-haired women and towers of spider-haunted mystery, Krypton with its chivalry, Gorilla City with its shadow-guarded tombs, The Mountain of Judgment whose riders wore steel and silk and gold. 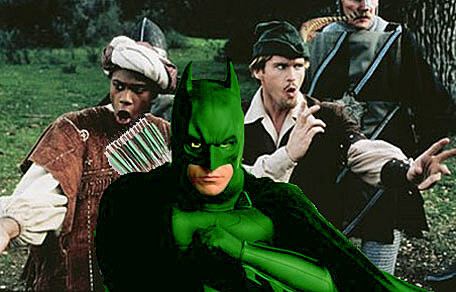 But the proudest kingdom of the world was Gotham, reigning supreme in the dreaming west. Hither came Batman the Brucewaynian, black-haired, sullen-eyed, batarang in hand, a thief, a reaver, a vigilante, with gigantic melancholies and... well, even more gigantic meloncholies, to tread the jeweled thrones of the earth under his booted feet." Jesus sets about gathering followers and recruiting them as "fishers of men," it only makes sense for him to recruit the man who "fished" for the most dangerous criminals in the world, taking him on as a shadowy 13th disciple and charging him with the pursuit of justice! But when Jesus is betrayed by one of his own men, the Apostle Bruce is on the case, using his keen detective skills to discover the traitor, but not before the culprit attempts to escape justice by hanging himself! You know what? We're going to go ahead and stop right there before the Pope shows up to excommunicate us personally. Although Robin Hood's newest ally more than made up for his refusal to wear the Lincoln Green of the Merry Men with his incredible hand-to-hand combat skills, brilliant tactical plans and first-hand knowledge of how the ludicrously rich operate, everyone in Sherwood Forest was starting to get annoyed with the way he kept referring to their leader as "Ollie." And when he started showing up at the castle every time the Sheriff Of Nottingham did shadow-puppets for Prince John, everyone pretty much agreed things just weren't going to work out. "Sic semper tyrannu--huh?! You're not President Lincoln!" 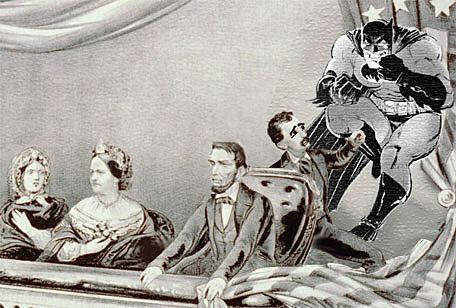 "Sorry to disappoint you, John Wilkes Booth, but Lincoln's safe. It's just you and me now." "You and me, long-ears?! I think yer forgettin' who's got the pistol!" "You don't get it, do you boy? This isn't Ford's Theater..."
"...it's an operating table. And I'm the surgeon." "I say Jeeves, it's these criminals!" "Yes, Jeeves, criminals! You know, lawbreakers. Hoods and the like. 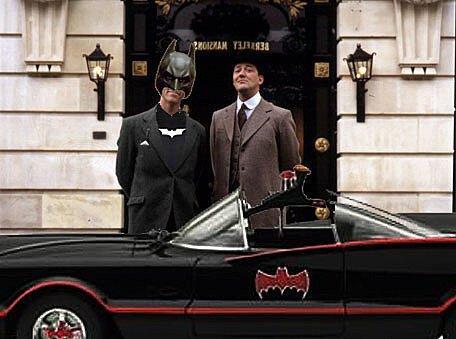 They're becoming rather... well, rather problematic, especially after that dreadful business in Crime Alley." "Crime and bad lives are the measure of a state's failure, sir." "Quite so, Jeeves, quite so! One of yours?" "It is the sentiment of the novelist Wells, sir." "Right ho, and well he is to think it. If only there were some way to... well, to strike back at the bally crooks, eh what?" "Of course, old man, of course. Put the old grey matter to it at once." "It has been said that criminals, sir, are a superstitous and cowardly lot." "And cowardly, sir. Perhaps if you were to disguise yourself as a horrifying creature, you could turn those fears against them." "A horrifying creature? You mean like Aunt Agatha?" "Perhaps something more predatory than Mrs. Gregson, sir." "You can think of something more predatory than Aunt Agatha?" "I say. A bat. That does have potential, Jeeves. That does have potential indeed." As World War II rages through Europe, one man -- highly trained, highly motivated -- sneaks past enemy lines and, through a series of harrowing adventures and thrilling, action-packed moments, makes it to "The Eagle's Nest," Hitler's mountaintop retreat in the Bavarian alps, climbing the last 124 meters hand-over-hand in the elevator shaft that leads to der Furher's private study. None of this would actually be shown in the comic, though, since that would just be Batman cockpunching Hitler for 64 full-color pages. You can just leave the Eisner for "Best Comic Ever" on the desk, we'll pick it up after lunch. 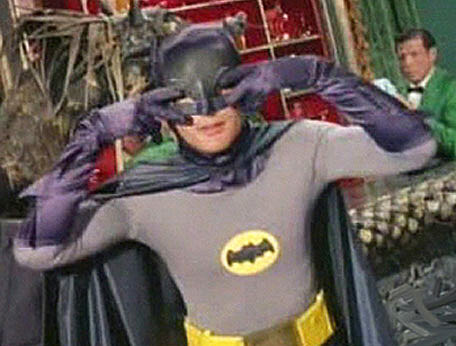 Forget about the artificial cultural touchstones like Woodstock and hippies, we want to see Batman in the brighly colored, camera-tilting Pop Art Sixties, with over-the-top scenery chewing villains whose complex schemes and Rube Goldbergian death-traps that can only be defeated with leaps of logic that even Batroc would have trouble making. Yeah, we know. We want it again. 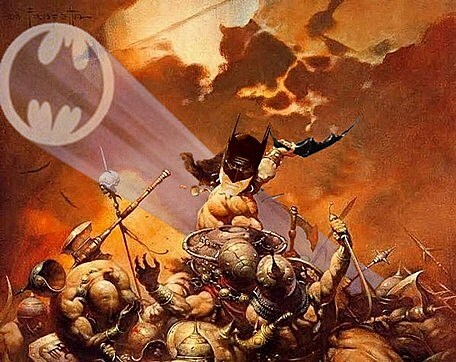 Sure, we all know how pivotal the '80s were for Batman, with groundbreaking stories like "Dark Knight Returns," "Killing Joke," "Year One," "Death in the Family" and -- of course -- "Ten Nights of the Beast," not to mention his re-emergence into pop culture with the wildly popular 1989 Tim Burton film, and that's great. 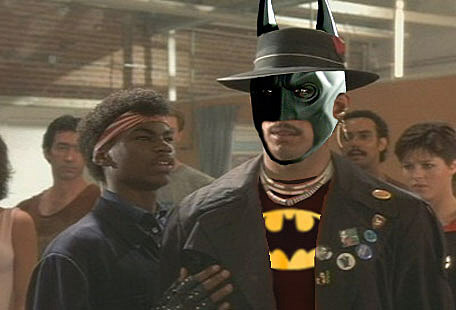 But did you realize that Batman went through that entire decade without once teaming up with a good-hearted but economically disadvantaged kid to save a neighborhood rec center through the unifying power of breakdance? Because as hard as it may be to believe, he did not. 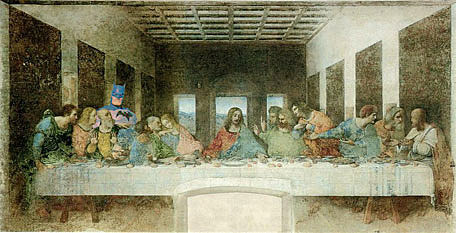 And now, after years of waiting, DC and Grant Morrison can finally fix this problem.